This mushroom stuffed paratha is a simple and delicious breakfast dish. Best served with curd and pickle, it can also be served for lunch or dinner. 1. Mix the wheat flour, salt and enough water in a bowl. 2. Knead well to a thick, pliable dough (similar to a chapati dough). 4. Saute the onions, mushrooms, green chillies and garlic for 2 to 3 minutes. 5. Add the masala powders and salt. 6. Stir well and cook for another minute or two. 7. Make small/medium balls of the dough and shape them into a cup. 8. Add 1 or 2 tblsp of the mushroom mixture to the cup. 9. Fold and shape into a ball again. 10. Roll this into a slightly thick paratha. 12. Cook the prepared parathas on both sides, applying ghee around the edges. 13. Remove and serve with pickle and curd. 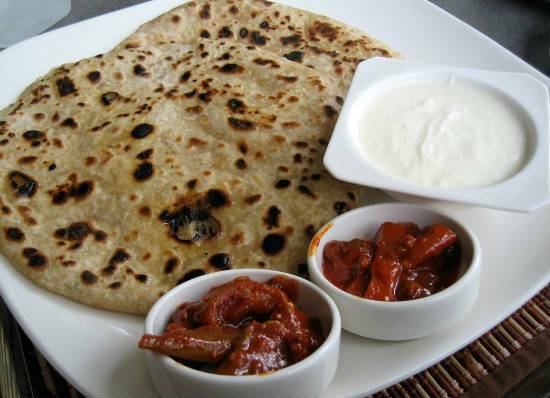 Feel free to comment or share your thoughts on this Mushroom Paratha Recipe from Awesome Cuisine.